SAL DeTRAGLIA'S VIRTUAL TAPAS BAR: A WAYWARD SON RETURNS TO THE MOUNTAIN. As mentioned in my last post, I’ve recently returned from a skiing vacation at Avoriaz in the French Alps. I began that trip somewhat sheepishly, as it had been eight years since I was last on skis. * It’s true that skiing—much like swimming or riding a bike—is a skill that you never lose. Unfortunately, the same is true of crashing and breaking bones. * Nobody wears puffy, goose feather-stuffed ski parkas any more. Now, it seems, all skiers wear a nylon or Gore-tex® shell over a thin, fleece lining. Unbelievably, these svelte, scantily-clad people appeared toasty-warm—even at -20ºC! 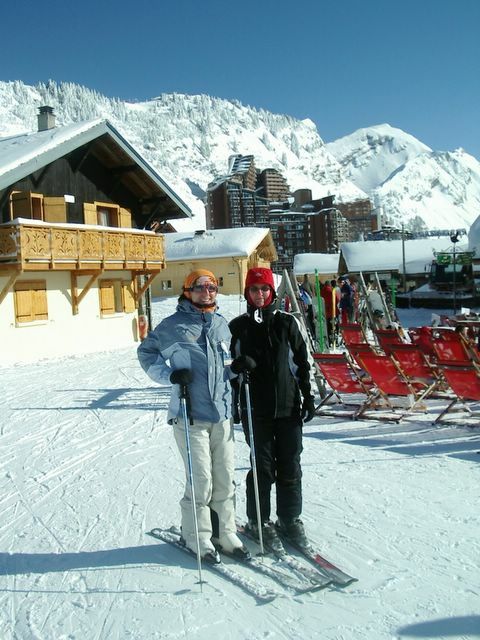 As such…even though I was in France, I didn’t see a single Michelin Man® on skis. * Technological advances are not limited to outerwear. Even lift tickets have gone high-tech. When I last skied, tickets were just a sticker wrapped around a metal wire hanging from my jacket’s zipper. The man tending the chair lift simply glanced at the ticket and, if it appeared to have been issued after 1955, would let you pass. These days, however, lift tickets are bar-coded. Each chair lift is blocked by a turnstile with a bar-code reader. You must insert your ticket into the bar-code reader which, if the ticket is valid, will release the turnstile and let you pass. I’m not sure how long I stood dumbfounded at the turnstile during my first morning in Avoriaz, but I would like to thank the friendly French man behind me who grabbed my ticket and stuffed it into the reader for me. * With regard to the turnstile that I mentioned above, I can assure you that it *IS* possible to get one leg through it and the other leg not. I would like to thank the friendly French man behind me who—after watching me struggle like a muskrat in a leg-hold trap for nearly two minutes—kindly released the binding and removed the ski from my rear leg. * Given the technological advances in outerwear and lift tickets, I was both surprised and disappointed to find that none of the shops sold Blue Tooth®-compatible ski poles. * Ten years ago, nobody wore backpacks while skiing. Today, most skiers do. What are they trying to hide?! * Of the hundreds of skiers I saw last week, only one wore a turquoise jacket. Sorry. That’s an inside joke that only three of you will understand. I won’t do it again. * All skiers now use “carving” skis. These skis are hourglass-shaped, and are supposedly much easier to turn than traditional, straight-edged skis. And in fact, they are! But what most intrigued me about carving skis was the myth that they should (and must) be used with one’s feet spread apart. This was exciting news! In the old days, the truly good skiers kept their skis locked together at all times. If you’ve ever tried skiing, then you know how difficult this skill is to acquire. Well...I can now confirm that this myth is precisely that—a myth. The good skiers continue to keep their carving skis locked together at all times; while the rest of us continue to look like snow-bound Caganers. * Pesky, annoying and dangerous…Snowboarders are the mosquitoes of the mountains. They are the reason that most skiers now wear helmets. When I last skied in the mid-1990’s, there were very few snowboarders. In fact, many resorts expressly prohibited them. But now, they out-number skiers. The main problem with snowboarders (aside from the ridiculous outfits that they wear) is their complete lack of coordination and control. Having watched them closely for an entire week, I can confirm that the only way for a snowboarder to stop is by crashing into a skier who is looking in another direction. * Skiing must be the world’s most expensive hobby. The second most expensive is, of course, collecting vintage Ferraris®. * It’s impossible to make a two year old wear gloves if she doesn’t want to. The one on the right is Mrs. Virtual Tapas Bar. The one on the left is the mysterious yet infamous Marta. Now, where's that cup of coffee I asked for? Yes, that parka-on-steroids probably would've saved my shoulder. Not because it would've have cushioned the fall, but rather it would have been impossible to squeeze myself through the turnstile in the first place. It's a good thing that Mom wasn't on the ski trip with you. She would have made you ski the rest of the day and the following day with a broken shoulder! Trust me, I know from experience twice! She has no sympathy for people with broken bones on a ski hill.....you can't lose the money you paid for the lift ticket! Haha! Nina - DCFS has just called me. What do you suppose they want??? MY NEW YEAR’S DAY HANGOVER. THE TWELVE GRAPES OF WRATH.